Almotamar.net, Google - A two-day battle between the imam, who wanted to impose Islamic law and Hamas forces left 27 other people dead. The crackdown could allow Hamas to be seen as a bulwark against militancy by the West. An imam who wanted to impose Islamic law in the Gaza Strip was killed today in an explosion at one of his hideouts, ending a two-day battle between his armed followers and Hamas government forces that left 27 other people dead. The security crackdown could allow Hamas, which has tried to court favor with the West, to position itself as a moderate Islamic bulwark against militant forces inspired by Al Qaeda. 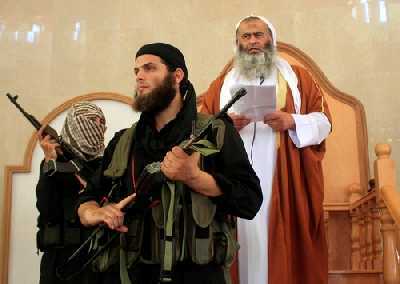 But the challenge by the imam, Abdel-Latif Moussa, also pointed to splits among Hamas' followers. Residents of the southern city of Rafah, where the clash occurred, said several former Hamas militants were killed while fighting for the imam's group, the Soldiers of the Companions of God. Hamas Interior Ministry spokesman Ihab Ghussein said the imam had espoused "perverted ideas and considered all Gazans as unbelievers" and had allegedly orchestrated the bombings of Internet cafes and a wedding party. The spokesman said Hamas appealed to scholars, clerics and parents to "educate the Palestinian people in correct and moderate Islam." Moussa provoked the clash Friday by announcing a campaign to impose religious law by force of arms. He made the declaration during a midday sermon in Rafah surrounded by black-clad gunmen who then holed up with him in a mosque and fought off Hamas security forces who besieged the building. The rebels eventually abandoned the mosque through an underground tunnel and continued the fight from nearby homes. After an overnight lull, a Hamas negotiator approached the imam's hideout in an attempt to talk him into surrendering. An explosion rocked the house, killing the imam, his aide and the negotiator, Ghussein said. Ghussein said the aide, a Syrian national of Palestinian origin, set off the explosion by detonating a suicide belt. There was no confirmation of the account by the imam's surviving supporters.